Pravoslava, goddess of Law expresses the authors’ views of law and order and of the spirit of the law. The authors ask to distinguish between Pravoslava, goddess of Law and other well-known goddesses: ancient Greek Femida and Dike, goddesses of justice, ancient Roman Justitia, goddess of justice and ancient Egyptian Maat. Concerning the terms “law” and “justice” the authors consider Justice to be a part of Law. 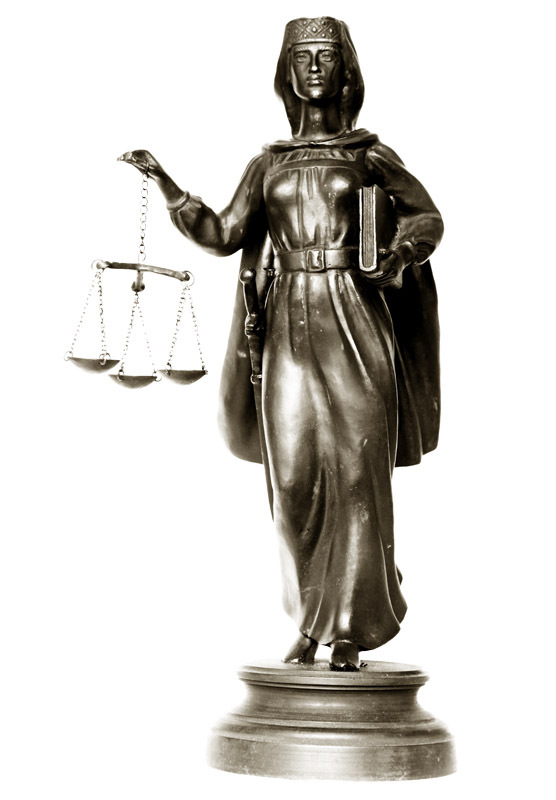 The scales consisting of three containers, equivalent and equidistant, symbolize the basis of the law: juridical (legal) constructions with their primary elements – permission, prohibition and positive obligation*. The precision of the adjustment made by a legislator to these three elements in the juridical constructions of specific normative documents provides the realization of the highest purpose of Law – “to build such a kind of social order which gives the best conditions for the creativity freedom of an “individual” to be implemented”. Positive obligation is an obligation to follow one’s own destiny, the destiny of one’s own clan and nation, and that of the humankind. “The juridical constructions allow to turn demands of life, merits of intellect and rich experience into the formations of individuals’ rights, liabilities, guarantees and responsibilities that are strict, mathematically precise and ready for further development. Through these formations the most important ideas and values can be realized”. This statement is especially true for Russia as a polybasic and multi-religious country. Representatives of different cultures can have different understanding of good and evil, a person often has to make decisions that lie beyond the limits of good - evil confrontation. In that case juridical constructions are strictly formed so that to favour the rights of particular individuals. All in all, the authors set the task to turn every trial into a creative process of regulating and perfecting the form of the society’s potential; to direct social energy – by means of the law – towards modernization and highest morality, towards reasonable values and ideals. Juridical constructions maintain the spirit of the law. Law is able to gear people up to creative activity. That what is legally proper becomes a fact. The sword in the scabbard symbolizes presumption of innocence. The woman’s headgear stands for worldly wisdom, the book – for knowledge and competence. Pravoslava, goddess of Law is shown in motion that means the law itself is constantly developing. * There were suggestions about the three containers symbolizing positive law, written law and common law; or – peoples’ rights, subjective rights and legitimate interests. CREATION OF A VIRTUAL IMAGE OF RUSSIA - "ARK RUSSIA"
Idea of Man and Society "Salvation" through spiritual maturation and deliverance from passions (defects) is fundamental for the majority of the nations of the planet. In the semantic concept of the word, «Salvation» is a meaningful movement to The High Target. - "The Ark" – is a symbol of salvation of modern civilization ( through Noah's Ark ) . The people who is involved in the construction of The Ark will be saved and spiritually developed. "The Ark" - is a long and steady project. It was in the previous civilizations and will be in the future ones. It includes the idea and the historical destiny . It creates it’s own culture , education , upbringing system , songs, stories, movies , and more. It creates legal norms and structures to ensure the implementation of the project . - " Ark Russia " - is the salvation project , according to which Russia goes by many generations after The Victory , mistakes and repentance , through the Evolution and revolutions , and invites The World to join it , to make this way its own, to enrich it with itself, to help Russia and other nations on the way and to accept support from them. - The Unity of People in the target, in the national idea - is the key to the national security. This statement is verified by the entire history of Russia. Unity of the peoples in the general idea and target is a pledge of the world security in its ability to confront the concept of " divide and rule" from the enemies of the human race . - West Civilization builds a secure, man-made "Ark " for the " golden billion " at the expense of the entire planet . Eastern civilization proposes to build "Ark" in its soul through the inner harmony, nobody is forced or invited . Northern civilization , in the face of Russia , is building its own "Ark" and offers all the people to join the construction. Entering the Russian state border is not necessary , it is not an administrative association , it is based on the unity of spiritual principles in the culture , in the unity of purpose and path. This idea was practically embodied at March 29 , 1994 when President Nazarbayev in Kazakhstan proposed to create Euro-Asian Union. He was supported by Russian President and the leaders of other countries , which were creating the Euro-Asian Economic Union , the Customs Union and CSTO. - Communality (ОБЩИННОСТЬ), Collegiality (CОБОРНОСТЬ) and Sophianic (СОФИЙНОСТЬ) – are the basic concepts , formed the Aim and Way of Russia. - Communality means the supreme goal of life through service to society with talents and abilities given by God to individuals and nations . Communality - is the legal truth - "We are the multinational nation of Russian Federation"
- Collegiality means the decision of inter-personal and inter-community problems by the meeting of representatives using Trialogue. It means a gathering of everybody who wish to get the ultimate goal by the common chosen path. Collegiality - is the legal truth - "Connected by a common destiny on own land." - Sophianic – is the divine wisdom in the Space Law (Act of God), related to the construction of the idea at our stage of development, the perfect state in which every person would be able to grow spiritually and creatively realize themselves in the service to the Society, to the Cosmos (God) and to the Nature ( the Earth). - Sophianic - is a legal truth "to honor the memory of ancestors who have conveyed to us the love for the Fatherland and faith in good and justice , based on the responsibility for our Fatherland before the present and future generations, recognizing ourselves as part of the international community." WE PROPOSE TO USE THE LEGAL TRUTHES OF THE NORTHERN CIVILIZATION AS THE BASIS TO BUILD A FUNDAMENTALLY NEW LEGAL STRUCTURES OF MULTIPOLAR WORLD.